Acid Etching - Why we don't use it! How Long Will Our Finish Last? 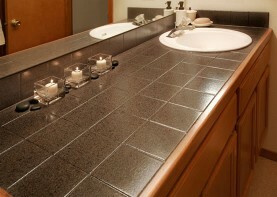 Miracle Method refinished tile countertops and vanities look better, feel better, and last longer than those of our competitors. And, we get your job done right the first time! Tile refinishing is a proven, cost effective alternative to the messy removal and replacement of tile kitchen counters, bathroom vanities and bathtub surrounds. Refinishing performed with the right materials and using the right procedures produces incredibly beautiful results! But not all refinishing is the same. No other refinisher delivers the quality work or level of service consistently offered by Miracle Method. Previously white tile transformed into a classy vanity with Natural Accents. Only Miracle Method has MM-4, a proprietary bonding agent. Acid-free MM-4 molecularly bonds the old and new surface together, ensuring quality and durability. Without a bonding agent, there is no assurance that the new finish will “stick.” MM-4 also allows Miracle Method to offer a guarantee against loss of adhesion on tile, as well as laminate, porcelain, fiberglass, acrylic, cultured marble and Corian® bathroom surfaces. A Miracle Method refinished countertop doesn’t just look like new again, it feels like new again. Miracle Method takes the time to detail the new surface, a step that most other refinishers won’t do. The best materials and procedures only produce the best results in the hands of trained professionals. Miracle Method’s technicians are licensed and insured and receive extensive training before they are ever allowed to work on a customer’s job. 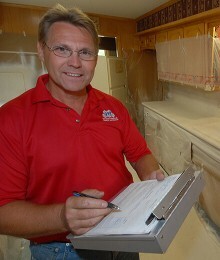 We will explain the process before refinishing your tile. We will thoroughly explain our process, complete the job on time, and do all this without any hidden charges or surprises. The bottom line…Miracle Method performs as advertised. Miracle Method has been known as the “The Preferred Refinisher” for over 38 years and has over 140 locations in the US and Canada. We specialize in refinishing. We know what we are doing and have successfully done work for most every major hotel chain in addition to thousands of apartments, college dormitories, and homes across the US and overseas. Other refinishers use everything from white enamel spray paint to yellowing epoxies to “ refinish” bathtubs. Miracle Method uses only hi-tech acrylic coatings that are especially formulated for refinishing. Our materials cost a little more, but also produce the best results. Miracle Method technicians never stop learning. Our organization holds regional training workshops and national conventions to keep our franchisees up-to-date and current with the latest technology and procedures for refinishing tile countertops, walls and floors. Continuing education is a requirement for each franchise. Click on Find a Location or call our toll free locator number, 1-888-271-7690, to reach the nearest Miracle Method professional and take advantage of the superior tile refinishing process they offer.